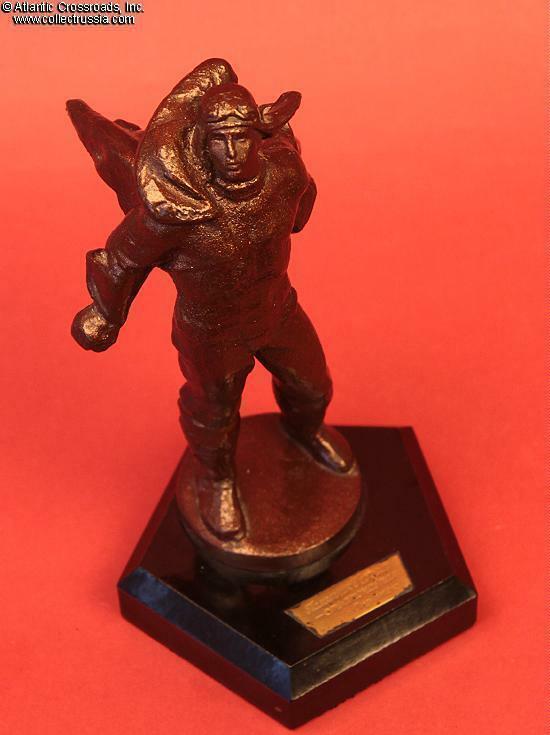 Soviet Stratonaut Statue, bronze plated miniature on a Bakelite base of a dramatic statue commemorating brave Soviet fliers who died while flying high altitude research balloons into the stratosphere. 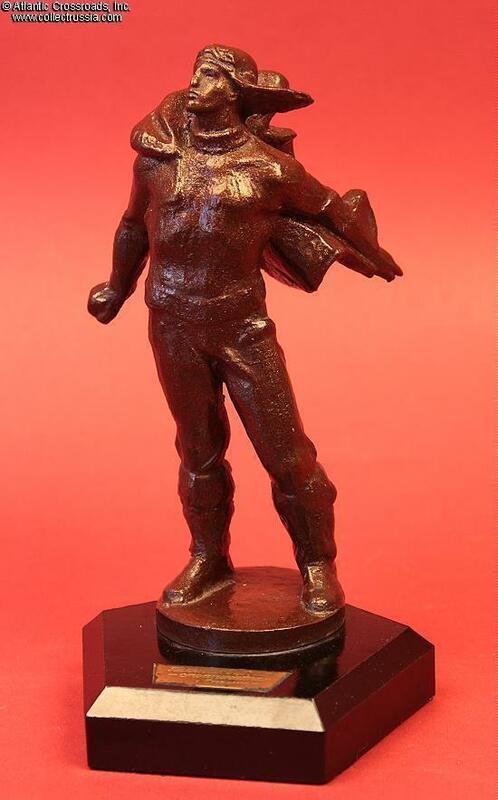 Soviet Stratonaut Statue, bronze plated miniature on a Bakelite base of a dramatic statue commemorating brave Soviet fliers who died while flying high altitude research balloons into the stratosphere. Circa 1950s-60s. 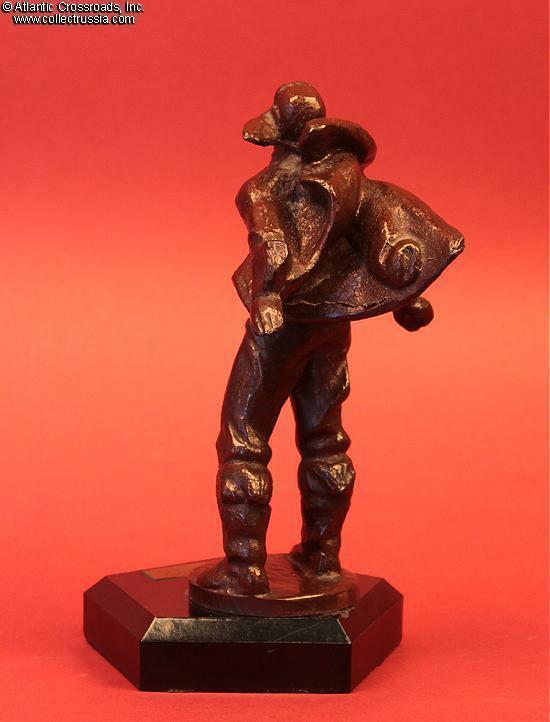 Bronze plated metal, Bakelite, felt. 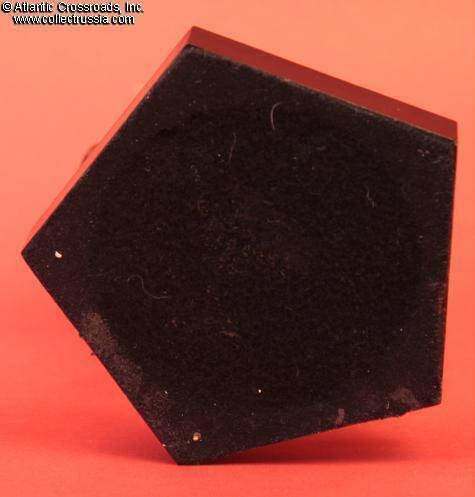 7 1/4" tall, base measures 4" at the widest point. Inscribed Russian plate on base translates as: "Monument to Heroes - Stratonauts, city of Saransk". Truly dramatic allegorical image of a Soviet pilot. 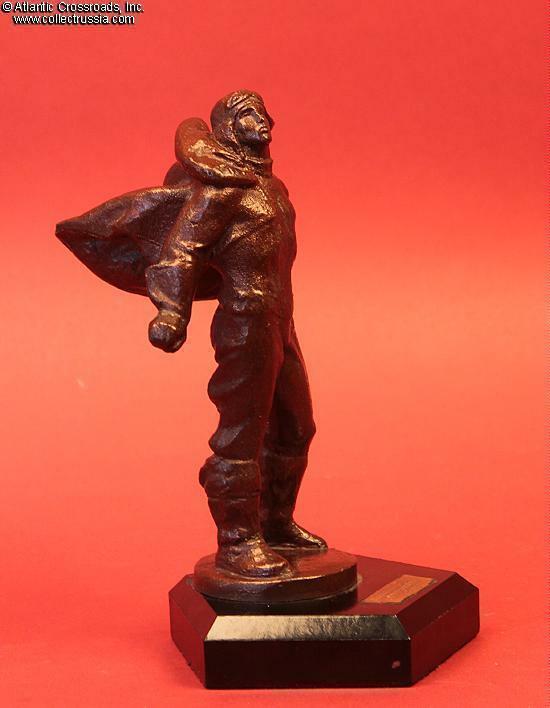 The larger than life original statue stands on top of a equally large stone column in the city of Saransk and displays on its base bas-relief profiles of three dead stratonauts. Excellent condition. The plate show a little darkening around the edges, probably caused by the metal not having a uniform coat of lacquer applied when it was first made. In the early 1930s, the USSR became very interested in the high altitude stratospheric balloon research flights then being conducted in Western Europe, primarily by the French. In 1933, the Soviets eventually set their own high altitude world record for a manned balloon flight when they launched USSR-1 Afterward, the Soviet postal authority issued airmail stamps showing their balloon in flight! After initial success, one Soviet high altitude balloon crashed, killing the crew, and within a year or two, the entire aeronautical research program more or less ceased operation.